It’ll be six months before the cheerful yellow flowers of sunchokes again dance above my head in the Outlaw Garden. These towering plants — also know as Jerusalem artichokes — spend the spring and summer growing tall and green and robust, only to reward us for our patience with sunflower-like blossoms and potato-like tubers after most of the garden is spent and done for the season. If we want those blooms come autumn — and their tasty tubers for next winter’s meals — we need to start planning ahead now. 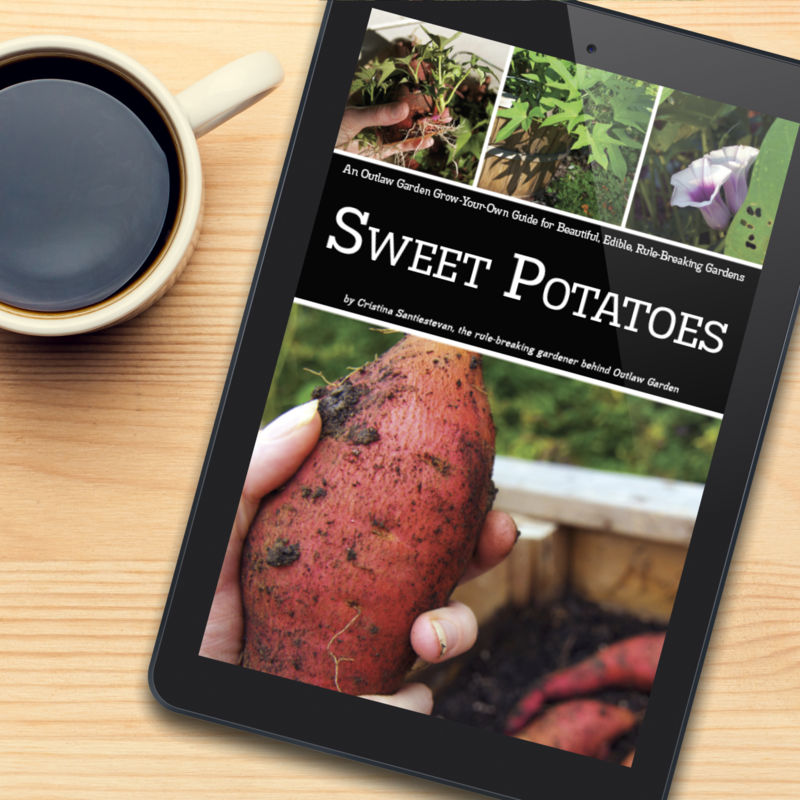 I’m working on an ebook about sunchokes — it’ll be similar to the sweet potato guide, with tips on starting your own plants, tending them all season, and harvesting them for use in the kitchen. It’ll be a few weeks at least before I have that guide ready for y’all. But, no need to wait for the full guide to get your sunchokes started. Here’s how I started my first plants — grown from grocery-store-bought roots — several years ago: Sunchokes from store-bought tubers? Hopefully! If you couldn’t guess, that experiment worked great. I have more sunchokes every year (though I’m careful to keep them contained — sunchokes can spread quickly if you let them roam free in the garden). Have you tried sunchokes before? If not — or even if so — what would you like to know about growing, harvesting, and landscaping with these edible beauties? I just came across your blog/site and it’s really interesting! I can’t wait for spring too, although over here in London it looks like Spring has already begun(just not officially). There’s little bulbs starting to flower, and the temperatures are getting warmer, I’m ready to plant my first seeds 😀 Hopefully, I can try some new vegetables this year, although I will definitely grow peas and cucumbers again, they were so easy to grow and so productive which is great, for a new gardener like me. Those Jerusalem Artichoke plants have really nice flowers, they would be nice to grow too.